Lewisham Council has just been notified by OnBlackheath that they have decided not to go ahead with the event this year. I understand that OnBlackheath are now working on plans for September 2014, which we are likely to hear more about towards the end of this year. I am writing to you on behalf of Sir Steve Bullock, Mayor of Lewisham, to acknowledge receipt of your email received 28th May 2013. Having looked into this matter at Sir Steve’s request, the proposal for Eliot Pits to be considered as a suitable place to install children’s play facilities was first suggested at a Blackheath Ward assembly by local ward councillors as a key ward priority to meet a lack of an accessible children’s play area. By way of background, the criteria set out for the selection of sites for a children’s play space were that the site should be publically accessible and within the boundary of the Blackheath Ward. Any structures should not impact on the vista of the Heath, not be sited too close to residential properties and any facility should not have a detrimental affect on the ecology of the green space. Ward Councillors discussed various options within the Blackheath ward with parks officers, the Blackheath Society and the Local Assembly and it was decided that Eliot Pits was an option to put forward to the next stage. Options for sites on the more open sections of the Heath were rejected due to the impact on vista. I am also advised that during these meetings no suitable alternative had been suggested by members of the wider public. That said, I would like to clarify that discussions into this suggestion are at a very early stage. The feasibility process has only recently started and nothing will be done until a phase 1 ecological survey is carried out by an independent consultant. Should the findings and recommendations in the survey conclude that the process can continue without detriment to the ecology of the area, the Council will commission landscape architects to begin the feasibility stage leading to outline design proposals. At this stage officers would carry out in-depth consultation with local residents, the Blackheath Society, the Safer Neighbourhood Team for Blackheath, the Blackheath Ward Assembly and other interested parties in addition to the relevant council officers. Following this, officers will ask the architects to complete the brief and then decide on particular proposals prior to seeking all necessary approvals and consents (Ministerial consent will be required for the permanent erection of the play equipment on the common). As part of the Ministerial consent process, there will be an opportunity for consultees to write to the Planning Inspectorate with any views on the proposal. I trust that this is helpful. I wonder whether having an active and responsive residents group in Blackheath in some way acts to the detriment of less wealthy parts of Lewisham in this instance. Because the Blackheath Society is so good at spotting potential sources of funding, it inevitably means that it will put in bids for funding more expertly than say a group based around a more deprived housing estate in another part of Lewisham. This isn’t a criticism of the Blackheath Society, just an observation. I thought this might come in handy – here’s a map. (click to get to the Google Map). The green area is Eliot Pits where the playground is planned. The blue is Heathside and Lethbridge, an estate being redeveloped without a play area. See the architects plans here. The orange is the big flat space of land mentioned in Kate B’s comment. I’ve no idea whether it is available or not, but it seems to me that there are plenty of urban areas in Lewisham which would benefit from a playground. If the Blackheath Society define themselves as Guardians of the Heath, that’s a tricky role to live up to, whilst attempting to please everyone in the area. It seems this proposal may have been a step in the wrong direction. 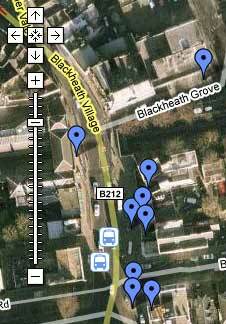 Tagged as blackheath, Eliot Pits, Eliot Pits map, Heathside and Lethbridge, lewisham, map, where are Eliot Pits?, where is eliot pits? Article in the News Hopper about Eliot Pits. Comes out essentially saying that there’s been an “outcry” from 550 petitioners. According to Steve Bullock’s office, the idea for using Eliot Pits as a pocket park was initially suggested by none other than the Blackheath Society. Unbelievable but true. That’s the same people who threw away £80K trying to stop a two-day pop concert just yards away from the one place in the area where urban kids can play as they would in the country. What are these people up to! I don’t know whether this is true, but I’ve dropped an email to the Mayor, to see what the response is. A report on the plan to build one of Boris’ Pocket Parks on Eliot Pits. See the previous post here for the previous post about this. Two Argentinian restaurants are better than one? It looks as though the Cactus Pit is going to become a CAU restaurant. (Planning application was here, but won’t load for me currently). They specialise in Argentinian beef according to their restaurant website, which mentions other branches in Cambridge and Guildford. So thirty seconds walk from a lovely Argentinian beef restaurant, Blackheath residents are going to have a second one. I really hope it doesn’t damage Buenos Aires, as its probably the nicest restaurant in the village (even for vegetarians). (Thanks to the anonymous bugler who spotted the application). Image above shows the CAU restaurant in Guildford.